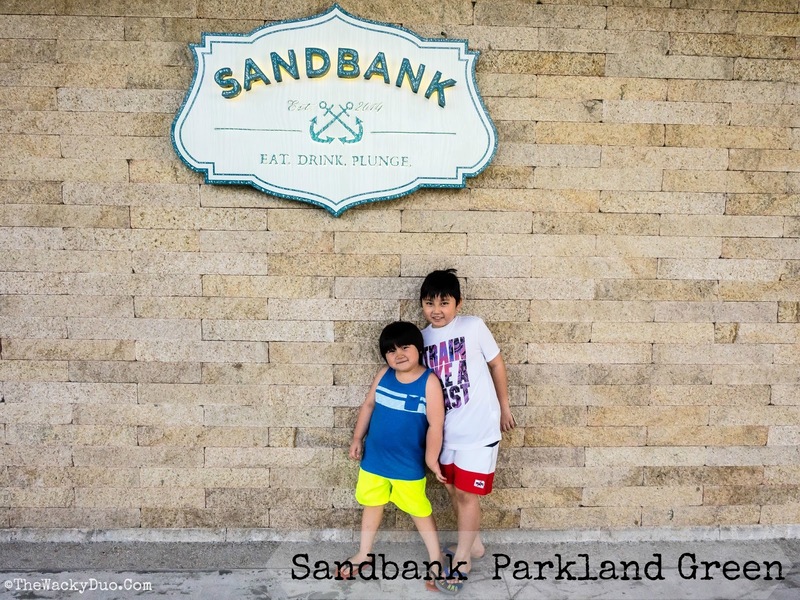 Sandbank @ Parkland Green : Eat, Drink & Plunge! Finding a family friendly restaurant in Singapore is always a treat for us. We love to have options where we can bring our kids to eat and feel welcome. Sandbank @ Parkland Green suits the bill and more.. This is a place where we can eat, drink and even plunge! Nestled in the East Coast Park - Parkland Green enclave, the restaurant had been opened for over a year. Even though we live in the vicinity, we had yet to explore Parkland Green, yet alone Sandbank. Like they say good things come to those that wait.... and I am glad we found a gem! Sandbank has plenty of space. It can easily sit 250 people and that means lots of space for everyone. With an open concept, it means you can feel the sea breeze funneling through the restaurant. In Sunny Singapore, a cool breezy al fresco dining is always a plus. With so much space, this place is great for mini family gathering or even a birthday party for kids. Given that is rare to find a restaurant with this acres of space in Singapore , this is luxury. To make it even more appealing for families, Sandbank has a breakfast specially prepared on Saturday, Sunday and Public Holidays. Price at a reasonable $19 nett for adults and $9.50 nett for children (4-12) , it is an affordable option for families to spend the weekend morning. Each seating is for 2 hours. The breakfast is a mix of intercontinental and local selections. From salads to mini hash browns to porridge, there would be a dish that both young and old can savour. Get your fix at the Eggs Station. Other than food, free flow of drinks including coffee and tea is available. The selection at the buffet may not be as extensive as the ones you would find in the hotel, but the essentials (and kids favourites) are there. There is yet one more thing that most restaurants lack that made Sandbank a standout amongst restaurants / cafes ... The Plunge Pool! The main feature of Sandbank and probably the kids favourite will be the 15meters long plunge pool. The plunge pool is divided into two sections of varying heights to suit different age group. One has a depth of about 0.9 m and the other at 0.5m. The deeper one will be great for kids above 6 while the smaller one will be suitable for toddlers (with supervision). If your children are big enough, you could kick back and have sip a cup of tea while they enjoy their time in the sun. Nonetheless do stay nearby so you could still keep an eye on them. Who wants to join me for a swim? Besides having a splashing good time in the plunge pool, the kids were also kept entertained by balloon twisting and glitter tattoo by Weekends Pte Ltd today! For the record, the boys spend more than an hour in the pool alone. That means an hour more indulgence on the (burp) buffet table for the parents. It is a morning well spend for both parents and kids. With the beach as at the doorstep of Sandbank, make the day complete with a visit to the beach thereafter. This place is worth a second visit. We will be back! To sweeten this review, Sandbank will be giving away a family package (1 x 4 pax) breakfast buffet treat for one lucky reader. 1) Like and Quote 'Eat , Drink , Plunge @ Sandbank' on the facebook post link or instagram post of the above photo. Results will be out on 16th March on this post. Winners are to response via email by 20 March with Full Name, contact number and email address. Thereafter prizes are to be self collected at Sandbank. Prize valid for one month from the date of contact. 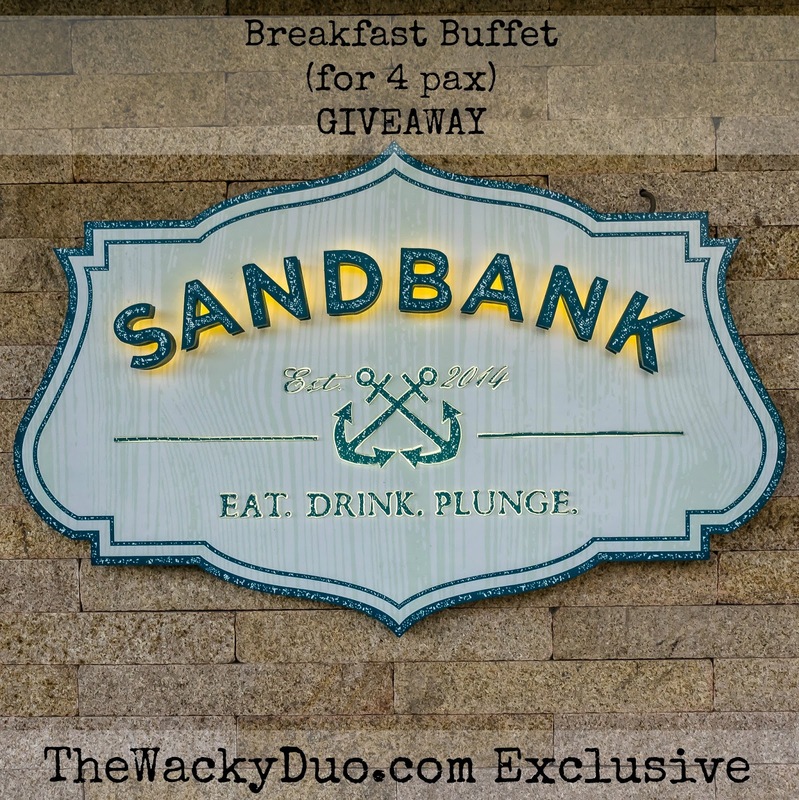 The Wacky Duo were invited to a morning of eat, drink and plunge @ Sandbank. All opinions are of our own.